Every time that I think the unicorn food trend – a trend which involves a generous use of ingredients like sprinkles, glitter and pink, purple and blue food colorings – is fading, I see someone share something colorful and delicious looking on Instagram and I get swept right back up in it. 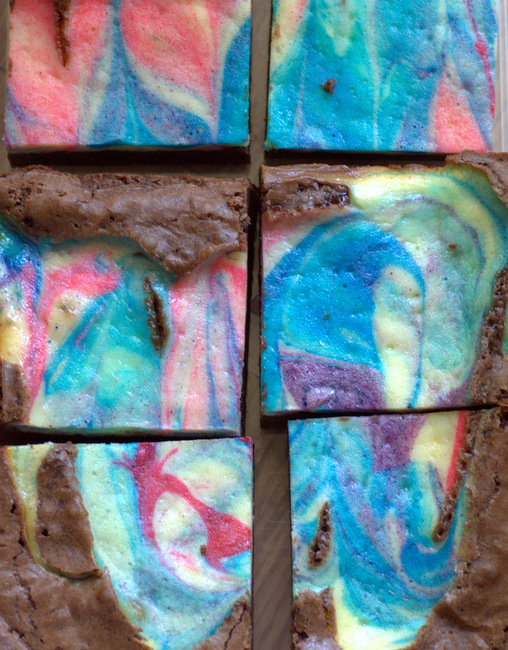 These Unicorn Cheesecake Brownies were the result of browsing Instagram while I worked on a batch of fudgy brownies. Inspired by the colors, I decided to incorporate them into this easy and indulgent dessert. The brownies themselves are dense and fudgy, with a rich chocolate flavor and a chewy texture. They’re satisfying brownies and they stand up well to the layer of creamy cheesecake batter that is poured on top of them before baking. The cheesecake mixture comes together very quickly and that is where the unicorn colors come in. After I mixed up the batter in a large bowl, I dipped a toothpick into some gel food colorings (which are thicker and tend to come in more colors than liquid food colorings) and swirled them through the cheesecake mixture. I made one portion of the batter pink, one blue and one purple while still leaving white visible in the bow, then allowed the colors to run together as I poured the mixture on top of the cheesecake base. I gently ran a knife through the cheesecake to marry it to the brownie layer after it was in the pan and before baking. I recommend gel food colorings for this recipe because they’re thicker and a little easier to work with. If you only have liquid food colorings, you will only need a couple of drops of each color. If you’re worried about blending the colors together in the same bowl, as I did, you can always divide your batter into three smaller bowls to tint it. The finished brownies are absolutely delicious with rich chocolate and tangy cheesecake in every bite. You’ll definitely feel a bit magical as you look at the bars, too. 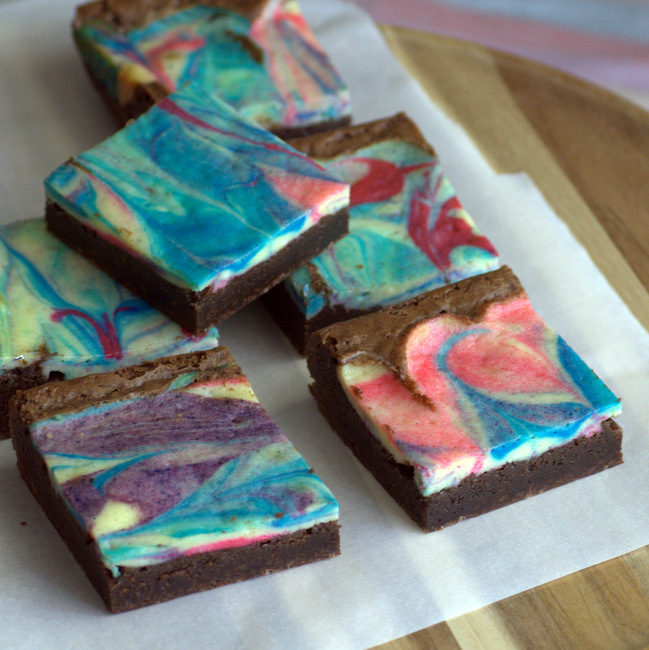 If you aren’t in a unicorn mood, you can omit the food coloring and make plain cheesecake brownies. That being said, I’ll be on board the unicorn trend and having fun with it as long as its around. In a large bowl, whisk together sugar, eggs and chocolate mixture. Stir until smooth. Sift flour and salt into the bowl and stir until just combined. Pour brownie batter into prepared pan and prepare cheesecake mixture. In a large bowl, beat cream cheese, sugar, egg and vanilla extract until smooth. Dip a toothpick into the pink food coloring (pref. gel coloring) and swirl it through the batter. Repeat for remaining colors. If using liquid food colorings, simply add a few drops of each color to the bowl and swirl carefully with a knife or spatula. Do NOT overswirl the colors; you should still see some white in the batter. Pour the cheesecake mixture onto the brownie batter. Gently swirl two batters with a butter knife. Bake for 35-38 minutes, until brownies and cheesecake are set. A knife inserted into the cheesecake mixture should come out clean and the edges will be very lightly browned. Next PostNext What is Butterfly Pea Tea? Wow these look amazing, definitely will have to give them a go! Love cheesecake brownies. Tried these and they were especially yummy and so colorful. Stored them in refrig and they stayed really moist and fudgy.